The Foothills snowshoeing program leads snowshoe trips for The Mountaineers throughout the winter season along with teaching Basic and Intermediate Snowshoeing courses and the Winter Camping and Advanced Winter Camping courses. Not sure if snowshoeing is for you? Beginner snowshoe trips are open to all Mountaineers members and require no badge. These are the easiest snowshoeing trips, and in some cases snowshoes are provided or can be rented. If you want to move on to more adventurous snowshoeing, sign up for one of our snowshoeing courses! This course is designed for those with no or little experience who want to learn basics of snowshoeing. Whether you are new to snow sports, want to have fun in the winter outdoors or yearn to take winter hikes, this is the course to get you started on your winter adventure. The course will cover the basics: moving in balance, maneuvering on snowshoes, going up hill, side-hill and handling downhills. Snowshoe gear required (assistance provided with rental options). The course is available to anyone over age 18 (or over age 14 if taking the course with a parent) who wants to learn snowshoe skills and how -- and where -- to safely enjoy snowshoeing in our Puget Sound Winter Wonderland. The course consists of one evening lecture and a full-day weekend instructional field trip (Saturday or Sunday options will be available). Graduates of the Basic Snowshoeing course are eligible to participate in Mountaineers Basic Snowshoes. The Intermediate Snowshoeing course is designed for adventurers who want to gain the skills and experience to handle more challenging snowshoe routes and terrain. Whether it's a winter backcountry vista, alpine frozen lake, or climb to the summit of a mountain, this course will take snowshoeing to the next level. The curriculum and required co-requisites will cover material needed to travel safely and survive in the winter backcountry. Topics include winter equipment, clothing, proper use of an ice axe, self-belay and self-arrest skills, avalanche awareness including terrain and snow pack evaluation, use of beacons and companion rescue, navigation, winter route finding, winter first aid, incident response and emergency snow shelters. Graduates of the Intermediate Snowshoeing course are eligible to participate on Intermediate level snowshoe trips. 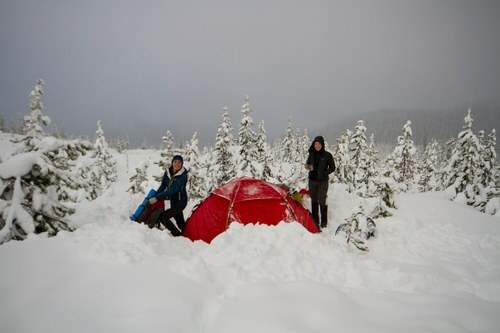 This course, including a lecture and several choices of overnight field trips, will teach and help you practice the skills and methods for safe backcountry tent camping in winter snow conditions, and guide you in selecting appropriate gear. The course is appropriate for first-time winter campers, though snowshoeing and backpacking experience would be helpful. Have lots of snowshoeing experience and want to join trips without a course? Contact Russ Immel for equivalency or if you have an interest in leading snowshoe trips.